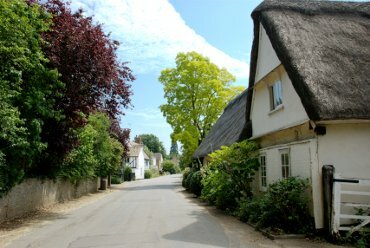 BeenThere-DoneThat: The Hemingfords (1) - Hemingford Abbots, Huntingdonshire. Hemingford Abbots and Hemingford Grey are two rather picturesque villages which abut and lie equidistant between Huntingdon and St. Ives but on the opposite side of the River Great Ouse. 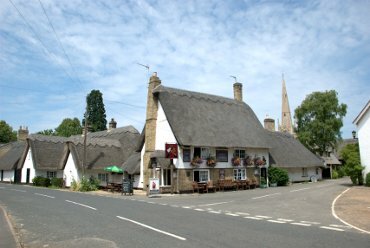 This is the centre of Hemingford Abbots showing the Axe & Compass Inn with the church beyond. Hemingford Abbots is a mix of older thatched buildings and large, generally attractive, modern houses giving the overall impression of a well kept attractive village. This view is along part of High Street. There is, except in a few places, no pavement for pedestrians but the traffic is extremely light and we found that walking in the road was really not a problem. 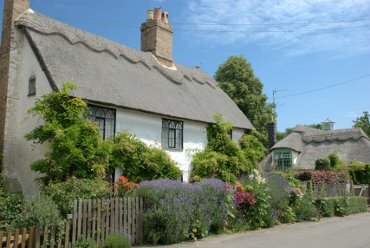 Still on High Street are these typical picturesque thatched cottages with the thatch displaying decorative finishes to the roof including a thatch pheasant on the ridge of the nearest cottage. 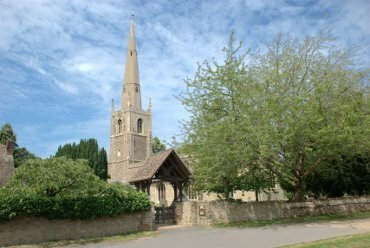 The Church of St. Margaret of Antioch dates from the 14th century, the spire being added in the 15th century and the roof was raised and 22 carved angels were installed in the early 16th century. The lych gate was donated by the church at Warboys, near Ramsey, in 1974.